In nineteenth-century Boston, amidst the popular lecturing of Ralph Waldo Emerson and the discussion groups led by Margaret Fuller, sat a remarkable young woman, Caroline Healey Dall (1822-1912): transcendentalist, early feminist, writer, reformer, and, perhaps most importantly, active diarist. During the seventy-five years that Dall kept a diary, she captured all the fascinating details of her sometimes agonizing personal life, and she also wrote about all the major figures who surrounded her. Her diary, filling forty-five volumes, is perhaps the longest running diary ever written by any American and the most complete account of a nineteenth-century woman’s life. 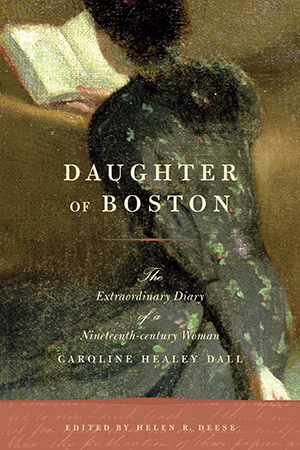 In Daughter of Boston, scholar Helen Deese has painstakingly combed through these diaries and created a single fascinating volume of Dall’s observations, judgments, descriptions, and reactions.